Scoop the Poop! Watch our video above about the importance of cleaning up after your dog! 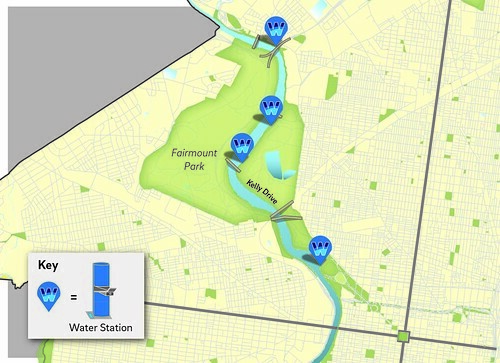 We received over two dozen nominations for the next Philadelphia Water Spokesdog. And while we personally think all these cute pooches would be great ambassadors in the campaign to spread awareness about the impact of pet waste on our waterways, it's up to you to vote in the champ. With the average dog producing about 200 pounds of waste every year, the negative impacts that come from improper disposal can add up quickly—especially in dog-crazy neighborhoods. Getting more people to obey laws requiring dog owners to pick up after their pet and place the poo-llution in a trash can means less untreated waste getting washed into our sewers and rivers during rains. You can read all about the Spokesdog contest by clicking here, and be sure to vote for your favorite pup by clicking here. Voting ends August 31, and the winner will show up in our pet waste educational materials and at community events to spread the word. All the Places We’ve Been! Did you receive our exciting December newsletter? If not, here is a version for download. For those of you who missed it, we highlighted some of our exciting events, including our newest Spokesdog winners, Sophie and Josie, and PWD’s involvement in Greenbuild – one of the biggest, greenest conventions to have ever hit Philadelphia. Our newsletter also details some of our upcoming events in 2014, like our Medallion Design Competition, and the next Green City, Clean Waters information session. Congratulations to Our 2013 Spokesdog Winners! On Saturday, October 19th, fifteen Spokesdog finalists from two participating neighborhoods (Fitler Square and University City) came out to compete for one crown. After careful consideration of which dog would make the best Spokesdog, judges announced and crowned the winners! Josie, a Beagle from Fitler Square and Sophie, an Australian Shepherd from University City, took home the titles for 2013 Spokesdog! Each 2013 Spokesdog took home $200 worth of prizes from local businesses and will be featured on a number of brochures, advertisements, websites, etc. In addition, winning Spokesdogs will serve as ambassadors to the City for living the eco-friendly life and will attend at least three community events over the upcoming year. These two dogs will help educate pet owners and their furry buddies about the importance of picking up dog waste in order to keep our streams and rivers clean. Congratulations again to the winners and thanks to all the dog owners, judges, and participants in this year’s Spokesdog contest! View more photos from the 2013 Spokesdog Crowning Ceremonies.